It is almost impossible to overstate the importance of the radical sounds born out of 1970s Germany to the developing musical landscape in the UK and further afield. Without the influence of Kraftwerk, Neu! and Can in particular, the genres of post-punk and electronica would have had to look elsewhere for much of their inspiration. The music of Public Image Ltd, The Fall, Low-era Bowie, Brian Eno, Joy Division, the Boredoms and innumerable others may well have developed along different paths without their example to follow, and the likes of Stereolab, Cul de Sac or Tomaga may never have come into existence at all. 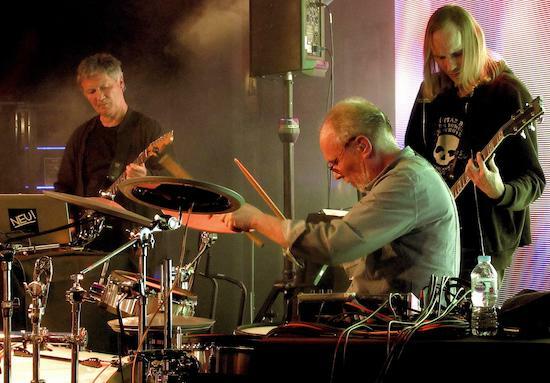 The three albums Rother recorded with drummer Klaus Dinger under the moniker of Neu!, are a distillation of what came to be known as Krautrock in its purest and most concentrated form. Rother’s ecstatic harmonic guitar drone, layered over Dinger’s precise Motorik beat and combined with producer Conny Plank’s spacious production may have won them little commercial success at the time of their initial release, but those records still sound close to perfect today. That Rother, currently with the assistance of Neu! 75 and La Dusseldorf drummer Hans Lampe and guitarist Franz Bargmann, is the only musician from that era still playing those tunes with an intensity that not only equals but surpasses the originals, is further cause for laudation. Since the Neu! track ‘Negativland’ sounds very much like proto Sonic Youth circa 1972, it’s entirely fitting that Thurston Moore plays support tonight at Under the Bridge, an intimate venue beside Stamford Bridge whose excellent sound and lighting more than make up for the slightly ersatz quality of its jazz and blues club influenced décor. Moore plays a gorgeous set of cyclical electric guitar riffs that flow and intersect organically like cross-currents in water and bloom intermittently into warm, resonating swathes of feedback. The trio of Rother, Lampe and Bargmann take to the stage soon after. Tonight Rother is due to play his second solo album, Sternataler, in its entirety in celebration of its 40th anniversary. Beginning instead with a combination of ‘Katzenmusik’ 1, 5 and 6, from his third solo record of the same name, Rother’s instantly recognisable signature guitar sound fills the venue with its joyous, sustained fuzz tone, as the screen behind the band lights up like a receding sunset. Rother often deals in melodies that are simple, yet majestic and sublime in their rendered texture. ‘Neuschnee’ from Neu! 2 and ‘Seeland’ from Neu! 75 follow, the former sounding significantly more vital and propulsive live than on record and the latter’s rumbling ambient tones ascending to higher altitudes than implied by the admittedly beautiful original. This is my third time seeing this line up, and it’s still hitting me hard just how much of a revelation these tunes are live. As much as I love the Neu! records, they are relatively restrained in comparison to these versions. Even the Sterntaler tracks, from an album I was previously undecided about, sound magnificent live. The sound of Rother’s guitar is so full of persuasive joy that it pushes all else from the listener’s mind. Lampe’s precise and steady drumming too, is a wonderful thing to behold. In his shirt and waistcoat, he looks like a master watchmaker creating perfectly measured time. The Sterntaler material is less driving than the Neu! tracks but has a compelling, pristine quality to its shimmering ambience that again transcends the original recordings. As an album of not quite 35 minutes, Sterntaler live is a short and sweet experience, but the tracks that follow are in a different league again. We get a pulsing, re-worked version of ‘Deluxe (Immer Wieder)’ from Harmonia (the ‘supergroup’ formed by Rother, Hans-Joachim Roedelius and Dieter Mobius of Cluster), and an irresistible, groove-driven ‘Hallogallo’ from the first Neu! album, that gets the crowd dancing wildly. An audience member shouts out: ‘Play that one again and for longer!’ As far as I’m concerned, in that moment, they could play it forever, and indeed, the absence of the opening track from Neu! 2, ‘Fur Immer (forever)’ is my only quibble about the setlist. Another great Harmonia song, ‘Dino’ follows, before Rother announces, ‘The rabbit is out of the hat’, and welcomes Moore back onstage for a clangorous, feral version of ‘Negativland’. Finally, ‘E-Musik’, from Neu! 75, transformed so much from its studio prototype that I didn’t recognise it initially when played at Rother’s set at EartH in Hackney in January, augmented again by Moore, brings the evening to an electrifying end. This prescient music, created as the sound of the future many decades ago, has lost nothing of its timeless appeal. If anything, its allure has grown as the rest of the world begins to catch up with Rother’s innovative ideas.